No, not you. I probably haven’t even met you so how could I possibly know that? Monkfish. They are ugly. If you’ve ever had the pleasure of seeing a whole one – fishmongers often just have the tails on display – you will know what I am talking about. Their heads are as wide as their bodies are long, they have 7 layers of skin, a massive mouth full of sharp fangs and they apparently eat puffins along with fellow fish that are almost as big as they are. You definitely wouldn’t want to come face to face with one while snorkelling, let’s put it that way (which would be an achievement as they reside on the ocean floor but then I have no idea how serious a snorkeler you are, so I guess it is possible). I initially decided to give this a whirl because I was trying to find something interesting to do with turmeric. You don’t hear that every day do you? My turmeric imperative arose partly because it is widely regarded to be extremely good for you for a whole host of reasons (including for people like me with tedious back or other inflammatory joint pain) but mainly due to my inadvertent purchase on Ocado of a tub large enough to sustain a small chain of Indian restaurants for a month. I was contemplating yet another curry or this turmeric honey tea when I remembered a most brilliant thing I ate in Vietnam back in the halcyon days of my youth when I didn’t need to pack 76 packs of wet wipes and 9 vehicle-based sticker books to go on holiday. It involved lots of turmeric and lots of dill. 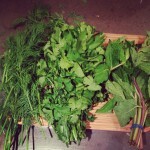 And where there is lots of dill, there is lots of happiness. In my (sticker) book anyway. This dish is the speciality (and only thing served) at a tiny restaurant called Cha Ca La Vong in the old merchants quarter of Hanoi, which has been serving this since 1871. They bring you fish which you cook in hot turmeric oil at your table and eat with loads of dill, other (lesser) herbs, fish sauce, shrimp paste, cold rice noodles and peanuts. It’s one of those places that features regularly on 100 Things to Do Before You Have Kids And Only Go on Holiday to Portugal lists. No doubt travel snobs will tell you that it is terribly touristy and a not at all echt Vietnamese dining experience. WHATEVER. If you happen to find yourself in Hanoi soon, do go. It’s one of those things you just have to do, not least because cha ca is everything that is brilliant about Vietnamese food: hot (fish), cold (noodles), sweet and sour, herby and spicy with lots of crunch from the nuts. It is a really great light(ish) dinner, featuring lots of things that are really good for you – fish, fresh herbs, ginger, turmeric and chilli. There are loads of recipes for this dish, all of which vary slightly. I went with Bobby Chinn’s version as I bought his book Vietnamese Food about five years ago and rather shamefully never made a thing from it. I dusted it down again a while back when I read that he had opened a restaurant in London (House of Hô) and it was sitting in the kitchen so it seemed rather churlish not to go with his version when the turmeric dill fish urge struck me. His version is really simple and involves grilling or barbecuing the marinated fish, rather than setting up your own hot oil station in your kitchen. Which is probably preferable on a Wednesday evening. 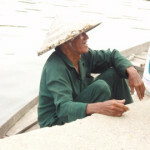 The Vietnamese make this with a freshwater fish known as basa or river cobbler. It is imported quite heavily into the US and the UK (it is also known as pangasius, panga or Vietnamese catfish) and I would guess that given the geography it probably makes its way to Australia and NZ as well. 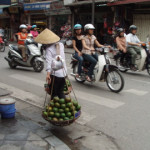 Tesco, Asda and Sainsburys all carry it but there has been quite a lot of concern over sustainability, farming techniques in Vietnam and (probably overblown) scares about contaminants (the Mekong not being famed for being a particularly clean river). Sainsburys do, apparently, now carry a certified sustainable river cobbler so if you want to be really authentic you could try that. I am not wild about supermarket fish that has been frozen and then defrosted before sale and am a bit of a stickler for buying locally caught fish where I can, so I stuck with Bobby’s suggested monkfish, which works brilliantly as you do need something with a firm almost meaty texture to stand up to the grilling. There are, of course, significant sustainability issues around monkfish as well. There is a bit more about that for those that are interested at the bottom of this post but, from what I can best tell, if you live in the UK and can find gillnet fished monkfish from Iceland, Devon or Cornwall, eating it very occasionally is probably fine. Digging around online suggests that ling and sturgeon would also work well (if you live somewhere you can get those – and both have their own sustainability issues). 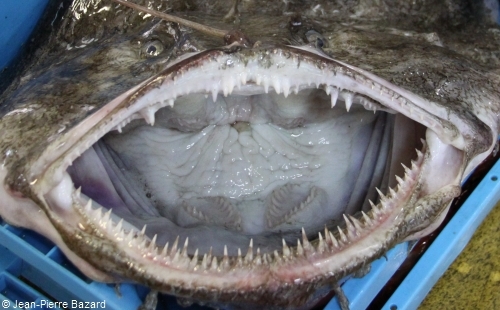 I have seen cod and haddock suggested but I do think this is one of those times where monkfish’s quite unique texture is hard to replicate and you’d probably be better giving (sustainable) cobbler a whirl than something that may disintegrate on the grill. As Bobby says in the intro to his recipe – don’t be put off by the long ingredients list/steps: the only work is marinading and grilling the fish and mixing up the dipping sauce, the rest is just a shopping list. You could even ditch the dipping sauce altogether and just use fish sauce to dip/pour over, but I would definitely recommend making up the nuoc cham to serve with this (and it keeps well in the fridge). Crazy Ingredient Ratio: Medium to High depending how authentic you want to be (fish sauce is a minimum requirement here but that is easy to find. Rice vinegar for the dipping sauce is also easy to find in big supermarkets now but can be substituted for cider or white wine vinegar at a push but you may need to use a little less and/or add a little more sugar. If you want the water bug gland extract mentioned below, you need to get yourself to a proper Vietnamese supermarket. 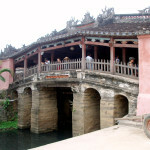 Or to Hanoi). You need to start this about an hour before you want to eat, to marinate the fish, earlier if you need to pre-soak wooden skewers. 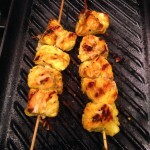 (This is best cooked on skewers so that lots of the fish is in contact with the grill. If you don’t have skewers, you could marinate the fish and cook in pieces). I have made this with both fresh and dried ground turmeric and the flavour difference is very small indeed. Dried is far easier to blend into the marinade (and easier to buy). If using the fresh stuff use plastic gloves as it STAINS your hands like nothing on earth and you will look like you have some horrible fungal nail infection for days afterwards. The dried stuff also stains as you’ll know from curry cooking but it is much less aggressive than fresh. 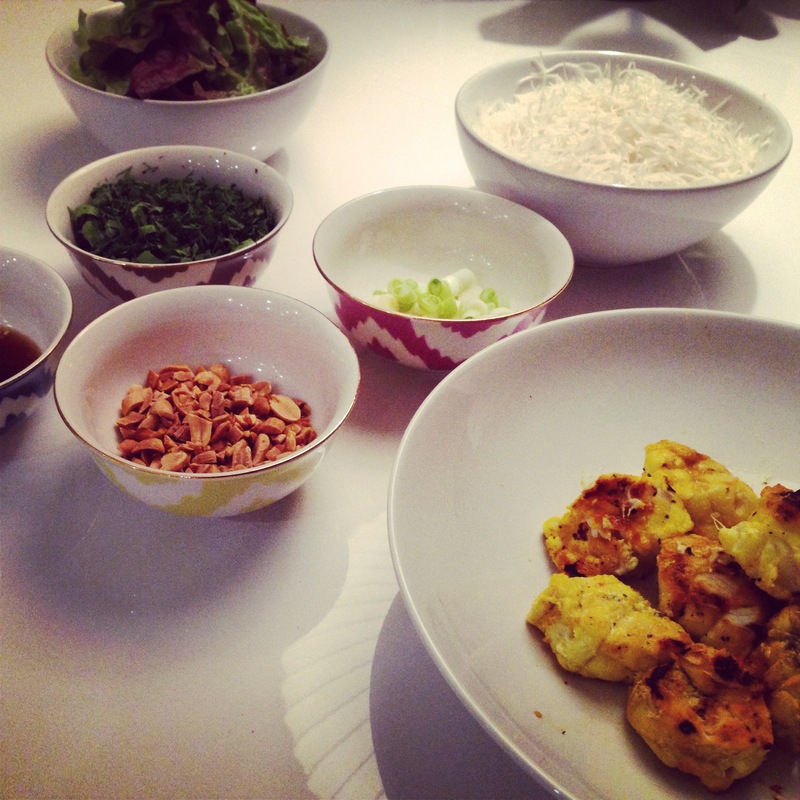 We ate this with the accompaniments below, and the nuoc cham dipping sauce. Bobby also suggests a sweet and sour sauce (which looked a bit involved and I couldn’t be bothered with but is basically a classic Chinese sweet and sour with peppers and pineapple), Mam Tom (a fermented fish paste which even he suggests is a very acquired taste) and Ca Cuong (the pheromone gland found under wings of the Giant Water Bug) which he highly recommends but which I am fairly certain you won’t find even in a decent Waitrose. (If you live in Hackney, you may have better luck. The real stuff (rather than the synthetic one) is the truffle of Vietnam apparently, adding an aromatic pear-like flavour to the dipping sauce). Finally, if buying from a fishmonger, make sure he or she has removed the pink/purple membrane from the monkfish as it is very hard to get off at home and will make the fish twist up and curl when cooking if it is left on. Skewers to cook the fish on, pre-soaked if wooden. 20g each of dill, coriander, thai basil, mint leaves (or some thereof but dill is key) – this is a vast amount which is how it is traditionally served. I used about half of this amount and didn’t use thai basil as my husband despises it. Using a fine grater or food processor, whizz the galangal/ginger and fresh turmeric (if using) into a watery paste (or as close as you can get). 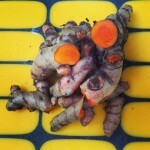 If using dried turmeric, whizz up the galangal/ginger and then mix in the turmeric. Stir in the salt, sugar and lime juice. Skewer the fish and coat well with the marinade and leave in the fridge for an hour, removing it around 20 minutes before you want to cook to come back up to room temperature. 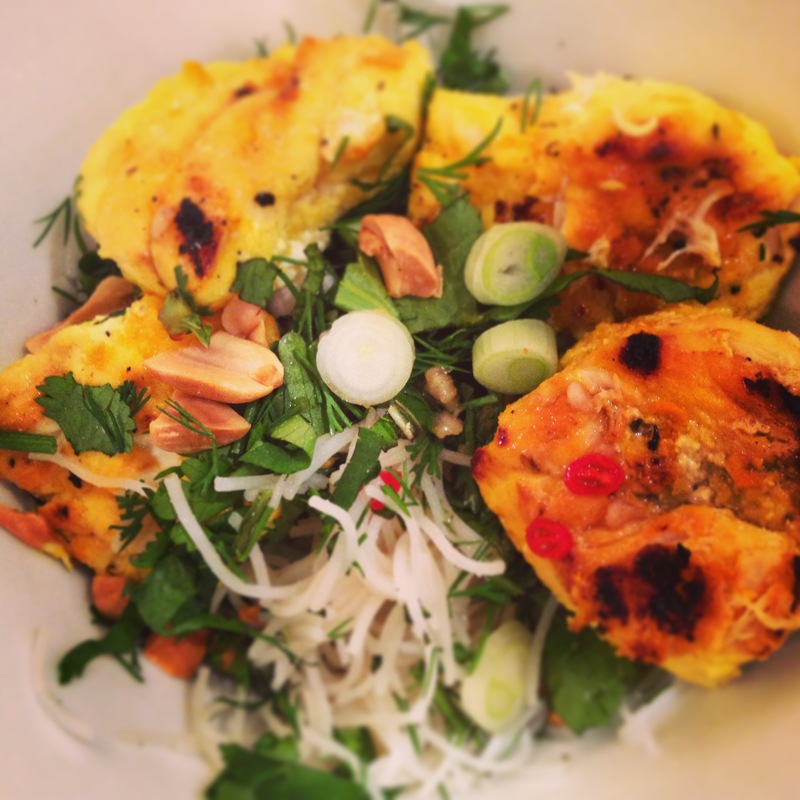 Make up the nuoc cham, if using by mixing together the vinegar, sugar and 30ml water in a saucepan. Bring to the boil and set aside to cool. Once cool, add the chilli, garlic, fish sauce and lime juice and mix well. Set aside. Prepare the accompaniments and set them out in bowls on the table. They should all be served at room temperature. Heat a griddle pan, grill or barbecue until hot (or an oven to 230°C if you can’t grill for some unknown reason). Oil the pan/barbecue grill surface and brush the fish skewers lightly with oil. Season the fish well with salt and pepper. Cook the fish on the grill (or in oven) for 8-10 minutes, turning occasionally, keeping a careful eye on it because the sugar in the marinade (which caramelises beautifully) will burn if you overcook the fish. On Sustainability: Monkfish is on the MCS “eat occasionally” list and rightly so: stock information is relatively scarce but as a slow maturing/reproducing fish they are very vulnerable to overfishing and, being bottom dwellers as they are, they are usually caught by beam trawling which is extremely damaging to the seabed and marine environment or by netting techniques that result in by-catch of other species and of young monkfish that die before they can be thrown back. There is presently no monkfish on sale in the UK that carries the Marine Stewardship Council’s sustainable certification. Of course, as with everything to do with sustainable fishing, the picture is not necessarily black and white: while there is still a lot of concern around Iberian stocks and those parts of the North East Atlantic and North Sea, many British fishermen have been working to ensure that their supply of monkfish is sustainable and, in some parts of the South West, stock is apparently stable and, in some populations, actually growing. Icelandic fisheries are apparently also achieving something close to sustainability and the picture in the US (particularly the Northern Atlantic) is pretty good. Monkfish is very rare in that, unlike nearly all other fish, it is difficult to substitute in certain recipes (like this one). For what it is worth I take the view that I eat it so occasionally that I can justify doing so if I make the effort to seek out gillnet fished monkfish from sustainable stocks. What about the sustainability of the fish?..